It's summer and campus is slow. I saw 5-6 different student-led tours of campus as high schoolers try to figure out if they want to spend their next four years here in paradise. Parking Garage 1 and 2 are undergoing some maintenance, though it doesn't look like they're adding the laser parking space counting system to either one like they have with Parking Garage 3, which is a bummer. Also, the parking lot east of the medical school is being revamped though IIRC is was mostly faculty parking anyway so don't get too excited there. 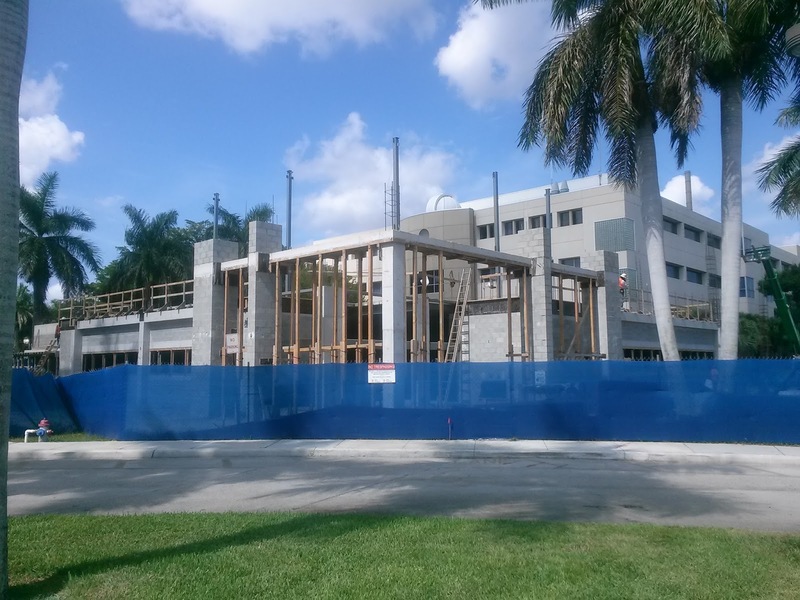 The FAU Medicine Office Building between Science&Engineering and the Schmidt Biomedical Sciences building is coming along pretty quickly. We've talked about it before so I won't reiterate its purpose. And here's a shot of the rendering for reference. Across the street there's no construction yet on the upcoming Schmidt Family Complex for Academic and Athletic Excellence that will be built adjacent to the stadium. 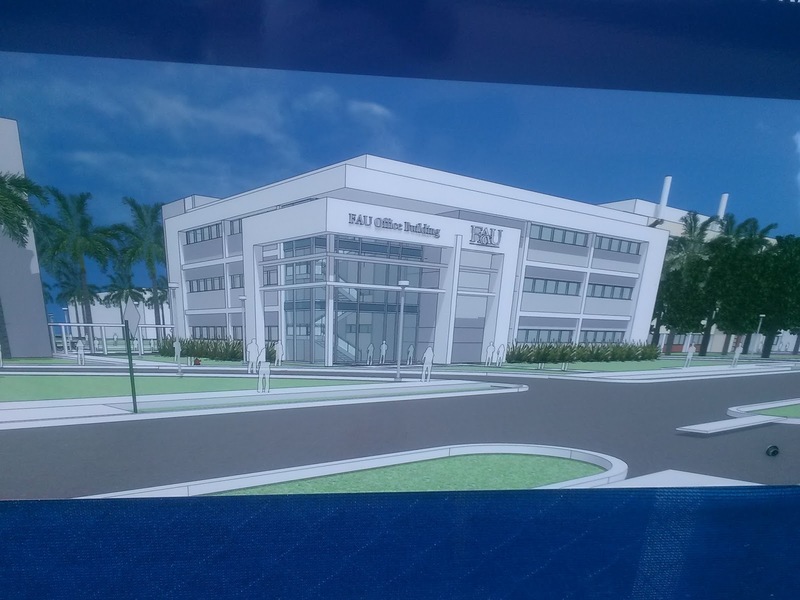 No news yet on when the groundbreaking will be, although if they're phasing this and going to build the first part with the $16M, I'd imagine we'll see the groundbreaking in the near future especially in light of President Kelly's "everybody's going to eat our dust" approach to improving things here at FAU. Renovate Science & Engineering including moving Geosciences back over from the Physical Science building to expand Chemistry in the PS building. Build a 52,000 sq ft Phase 2 for the Culture & Society building (you know, the building with the movie theater) including a "music rehearsal/performance venue." Renovate the SO building and "a primary focus will be the enclosure of the existing open corridors" which means that all that open space downstairs will likely become an indoor lobby. So those are some of the major projects in the future if they get state funding. Built let's downshift back to minor projects. 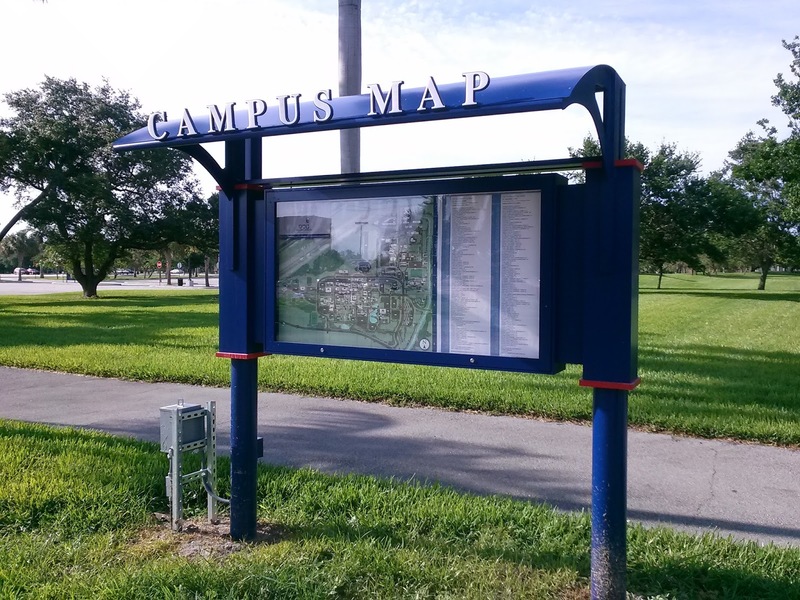 Updated campus map signs are popping up. Love the style. Still no movement or announcements on the dining hall attached to Parliament Hall (the newest dorm). There's a Puur and a Red Mango in there, but the space has looked pretty dead for awhile, so I have a feeling like they're exploring other concepts for the space. I've seen a couple requests for Chipotle by FAU students but we'll see what Chartwells wants to do. Students at "Dine With the Directors" meetings have complained that the dining options do not reflect the diversity of the campus… for instance, no Jamaican options. Medical students want a coffee option closer to them (which is a no-brainer). Staff suggested a $99 all-you-can-drink coffee card for the year. Students want more all-you-can-eat locations on campus, and I'm particularly surprised there isn't one on the east side of campus; think about how far you have to go from the University Village or Innovation Village apartments to get food at the Caf (sorry, Atlantic Dining Hall). A lot of good ideas there. Personally I think a cheap thing that would have an immediate impact would be to bring those food carts from the stadium down and set them up in the Breezeway between GS and Sanson Science - that middle stretch across from the Jewish Center - during peak hours (10am-6 pm). The carts already exist… they just need to move them over. Speaking of food, JJ's Red Hots (the NC-based hot dog place shown here) in the Breezeway Cafe has closed and JuiceBlendz will be expanding as "JuiceBlendz Cafe" to take over the space and offer an expanded menu. Sorry for the bad shot below, but yeah. 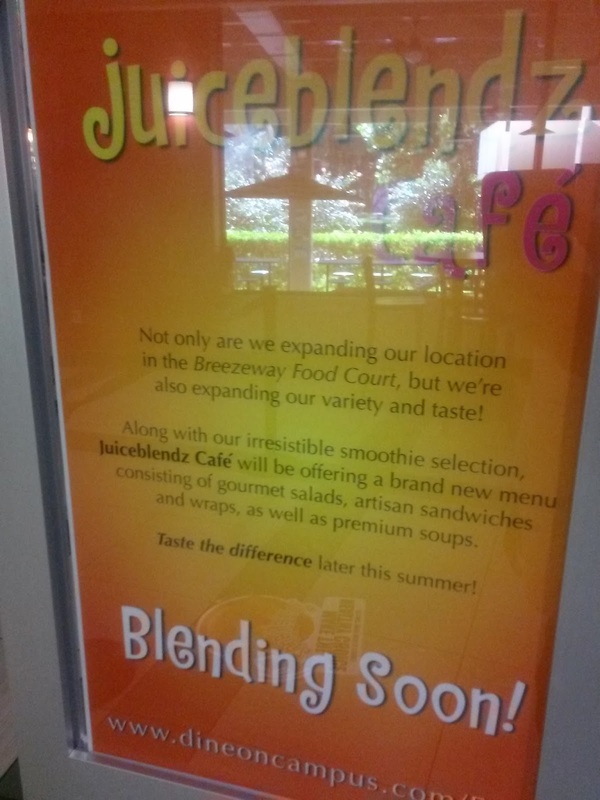 I had previously seen the Breezeway sign promoting a salad place called "Crisp" in the JJ's spot, but that has since come down and this Juiceblendz Cafe concept showed up instead. There's been call for more vegetarian/vegan options on campus outside of the Atlantic Dining Hall, so it's always good to see more salad pop up. Plus it's healthier than a hot dog. It's hard to be surprised about JJ's closing, though I did hope they could hang on because you always want to support Chartwells thinking outside the box. Fact is, Hot dogs are a hard sell outside of sporting events, Costco and big cities. Furthermore, as I explained in the previous photo update (click), it didn't do anything for me. For a really great hotdog in Boca you want to visit Hotdogopolis, who interestingly-enough has been approached by Investments Limited about opening up a location on 20th Street. "We talked about that because we have the same landlord," one of the Hotdogopolis employees told me, "but right now we're trying to open a location in West Boca and a location there on 20th is probably too close to this current east Boca location. But yes, we're very interested." I hope it works out. If I were to hand-pick some of the best restaurants in Boca to move to/open a location on 20th Street, Hotdogopolis would definitely be on the list. Speaking of 20th Street, University Park has opened and looks to be thriving. Plum Park, now the Shoppes at University Park, will get its own entry in the near future, but the renovation is coming along with new paint, new sign, new pavers and whatnot, but still has some standard architectural issues like tree canopies blocking retailer sign space. Again, more on that in the future. 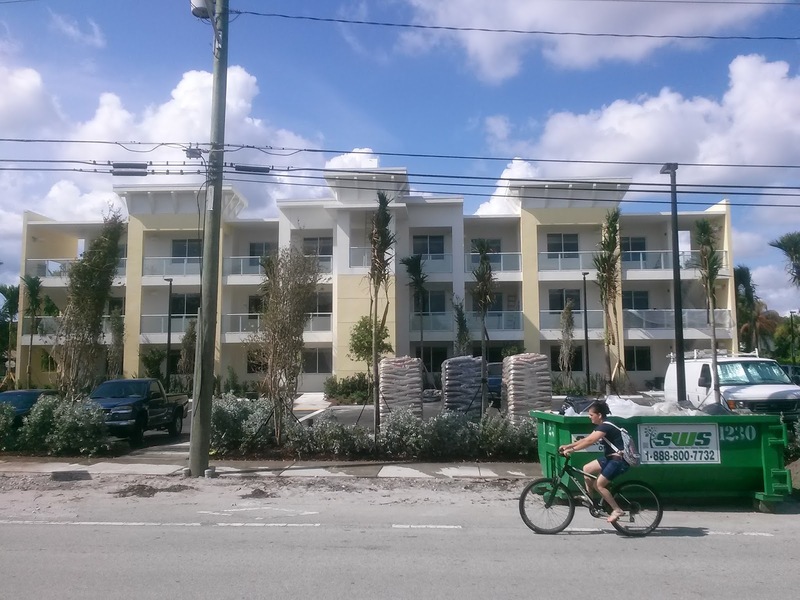 Looks like they're going to be finished in time for next month, which is important because as pointed out in the website above, they are "COMPLETE FULL FOR THIS 2015-2016 SCHOOL YEAR - SORRY AND PLEASE CHECK BACK WITH US NEXT YEAR"
Man, these student apartments fill up even before they open! 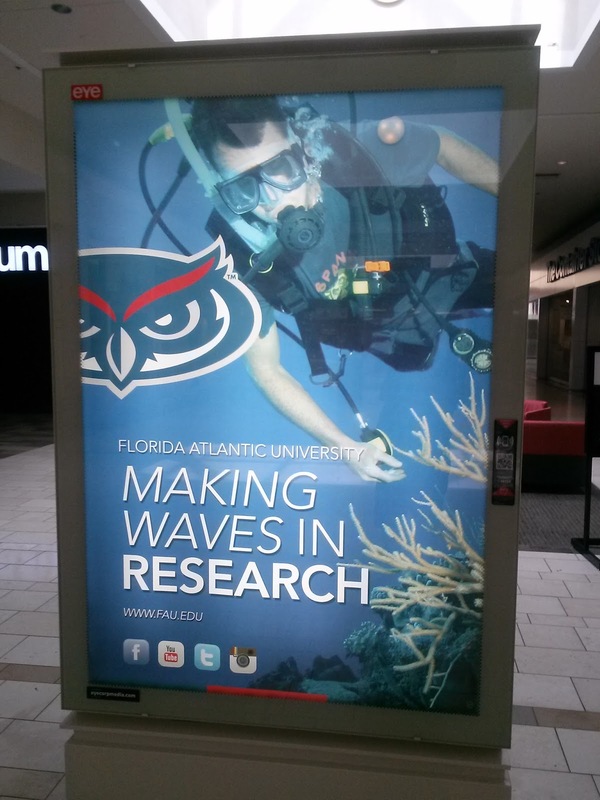 Meanwhile, FAU is Making Waves over at the Boca Town Centre Mall. Similar ads have popped up in Mizner and the Fort Lauderdale airport. It's important not only for future students to see this stuff but also the general public to have pride in their hometown university. 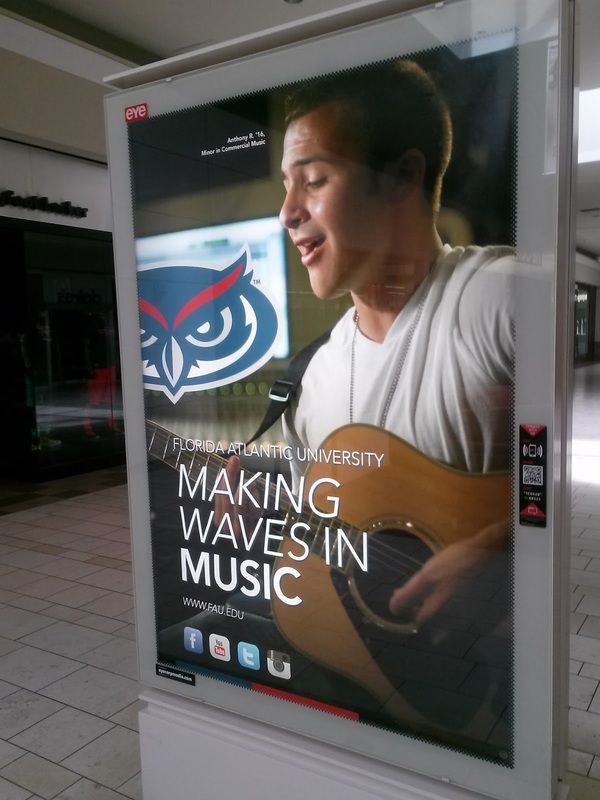 Very happy with FAU about this campaign. I wanted to close this entry by explaining a little bit why the blog exists. If you're reading this, you clearly have a vested interest in FAU - likely as an alumnus. That means you've probably had a class in The Spaceship, you've nearly slipped and killed yourself wearing sandals in a leaky Breezeway during a rainstorm, maybe you've walked around the Wimberly in your socks during an all-nighter. The people make the place, sure, but you've also lived the place, and in our case the place is constantly changing. 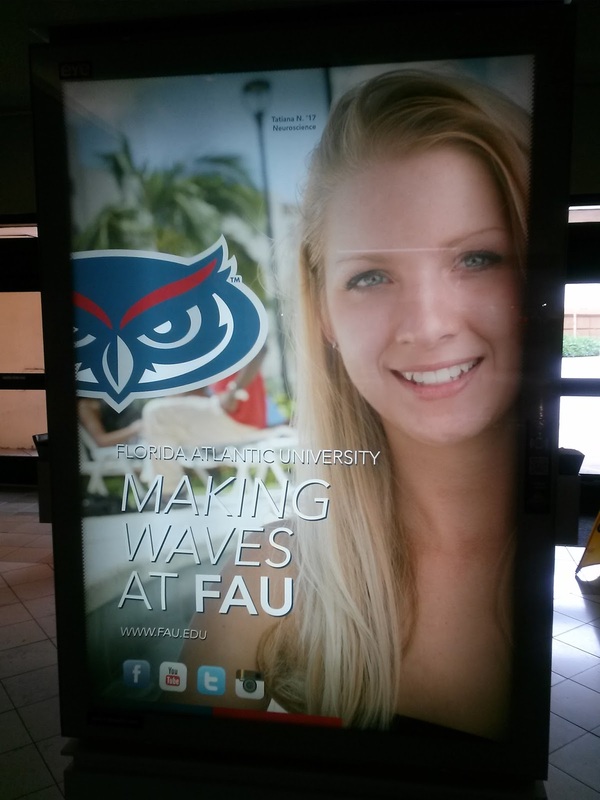 Students who attend FAU now often have a very different experience than those of us who attended only a decade ago, let alone those of us who were part of the first class in the '60s. For instance, I had a College Writing class in the southwest corner of Fleming Hall on the first floor… and now that same space holds vending and copy machines. So this all has sentimental value, and of course with change often comes improvements; the Caf (now the Atlantic Dining Hall) is majorly improved and undoubtedly attracts more students to our campus than ever before. At the same time, these things often go unnoticed. The University Press and the Alumni Association, for various reasons, don't cover a lot of this same material. And I don't fault them for that because they have their own priorities and limitations. But when I lived a couple hours away from campus, I still wanted to know what was going on here, and if I did, I imagine you all did as well. And although approximately ~37k of FAU's 136k alumni live in Palm Beach County, it's not always possible for alums to make a trip back to campus/the Boca area, so this way everyone can keep up without making the trip. I'm not a journalist by trade nor do I have architectural or urban planning experience. I'm not always right, especially when I'm trying to interpret vague documents. I'm just a fan like you trying to give you the most information from as many legitimate sources as possible. And of course, throwing in my two cents of how the university can change because you never know who's reading and hoping to make FAU a better place.